September 13, 2016 (Vancouver): The Canadian Parks and Wilderness Society is celebrating the recent designation of the Hecate Strait and Queen Charlotte Sound Glass Sponge Reefs as a Mission Blue Hope Spot. Hope Spots are described by Mission Blue as “special places that are critical to the health of the ocean” and are particularly deserving of protection. The reefs were one of just 14 sites around the world chosen for this special recognition. The Hecate Strait and Queen Charlotte Sound Glass Sponge Reefs were nominated by the Canadian Parks and Wilderness Society, who have been working to secure protection of the reefs for decades. “We have known for a long time that the glass sponge reefs are very special and really need protecting, so to see them announced as a Hope Spot, and just one of 14 sites chosen from around the world, is a really great feeling,” said Sabine Jessen, director of CPAWS’ ocean program. The announcement of the Hecate Strait and Queen Charlotte Sound Glass Sponge Reef Hope Spot was made by “Her Deepness” Dr. Sylvia Earle, world famous marine scientist and founder of Mission Blue, and Carl Gustaf Lundin, IUCN’s director of the Global Marine and Polar Program. 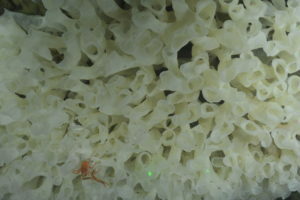 Living glass sponge reefs were first discovered in 1987 by a team of Canadian scientists who were surveying the seafloor of Hecate Strait and Queen Charlotte Sound. Before this discovery, scientists thought that glass sponge reefs had gone extinct with the dinosaurs some 40 million years ago. Dr. Manfred Krautter, a palaeoecologist who studied fossilized glass sponge reefs and was one of the first people to study the living reefs, likens the discovery to finding a herd of dinosaurs on land. Since the discovery of these sponge reefs, a few more smaller reefs have been discovered in Alaska and British Columbia, in the Strait of Georgia, Howe Sound and most recently in Chatham Sound, near Prince Rupert. The Hecate Strait and Queen Charlotte Sound Reefs are by far the largest living glass sponge reefs, covering an area of 1,000km2. The reefs can grow to a height of 25 m (equivalent to an eight-storey building), and are 9,000 years old. Jessen and her colleagues have been fighting to have the reefs protected as an MPA since 2001 in order to protect them from harmful activities. The MPA is close to completion, but Jessen is worried, “The proposed regulations that were released for public comment in 2015 were far too weak. They allow bottom trawling to continue right next to the reefs and other harmful activities like cable laying, anchoring, midwater trawling and trap fisheries to happen right around the reefs,” says Jessen. “As it is currently proposed, this MPA won’t protect the reefs at all,” she adds. According to Jessen, the announcement of the reefs as a Hope Spot is wonderful news. “The Hecate Strait and Queen Charlotte Sound glass sponge reefs are unique, they really are one of the wonders of the world.” Jessen hopes that this new designation will inspire Canadians and world citizens to learn about the reefs and stand up for their protection. “If we don’t protect them now, we risk losing the reefs again, this time for good. I am hopeful that we can give this amazing Hope Spot the protection it needs and deserves,” Jessen adds. ©2016 Canadian Parks and Wilderness Society. All rights reserved.